The play "Chikagoro Kawara no Tatehiki" was originally written for the puppet theater (Bunraku) by an unknown playwright and staged for the first time in the 1st lunar month of 1782 in Edo at the Gekiza. It was based on a real event that happened in Kyôto the 5th day of the 4th lunar month of 1703: the double suicide along the Kamogawa river of the rice merchant Denbê and the girl Oshun from Horikawa. 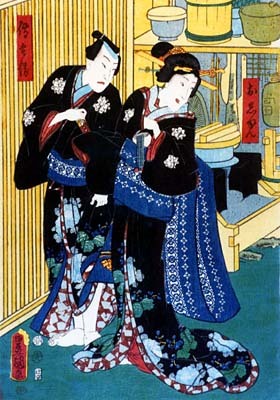 "Chikagoro Kawara no Tatehiki" was adapted for Kabuki in the 4th lunar month of 1807 by Nagawa Shimesuke I, Tsutsui Hanji and Nagawa Sôsuke. It was produced by Nakamura Kumetarô I in Ôsaka at the Horie no Shibai (casting unknown). The same thema, the love suicide of Oshun and Denbê, was recycled by Chikamatsu Tokusô in the drama "Sarumawashi Kadode no Hitofushi", which was staged for the first time at the Kado no Shibai in the 7th lunar month of 1795 and starred Arashi Kichisaburô II and Fujikawa Tomokichi I in the roles of the monkey showman Yojirô and the prostitute Oshun. The original puppet play was in 3 acts. The "Horikawa" act, the only surviving one, is the second one. Though Horikawa lies in a capital city, it might as well be a rustic place. Oshun, an ex-prostitute, was born here. Now her brother and mother are leading indigent lives. The brother manipulates monkeys, while the mother teaches ditties to neighboring lasses, for little money. Oshun has been living with them since she was discharged by her master. In fact, he feared lest his shop should be involved in trouble caused by Denbê, Oshun's lover, who killed a man. On a winter evening, Yojirô returns home from his work. Today too, his earnings are very small, but honest. Yojirô tries to behave merrily lest his mother worry about her daughter, Oshun. Both Yojirô and Ogin feel uneasy when they think about Denbê stealing into their house to see Oshun. They know that the young couple has decided to die together. Therefore, Yojirô and Ogin tell Oshun not to meet with Denbê even if he comes. They implore her to write a farewell letter to him instead. Oshun cannot help obeying their request. She writes a letter. But her mother and brother don't know what is written in it, because the mother is blind and the brother is illiterate. Night falls, and Denbê comes stealthily. He calls Oshun in a small voice. Of course he wants to die with her. Oshun instantly becomes aware of him. She opens the door quietly. Yojirô notices it. He is so horrified, that he mistakes Denbê for Oshun. As a result he lets Denbê come in and Oshun get out. He shuts the door and locks it. Because of this clamor Ogin wakes up. She also confuses Denbê with Oshun. Finally the mother and son become aware of their mistake. Yojirô recovers his senses in no time flat and thrusts towards Denbê the letter Oshun has written. At first Denbê rages against Oshun's fickleness, but as he reads it the content reveals itself. It says that Oshun's heart will not change whatever may happen and that she wants to die with Denbê to whom she has given her whole life. Looking at Ogin's grief and Yojirô's shock, Denbê reads their thoughts. He can do nothing but to bid farewell to the family and ask them to arrange for his funeral after he dies alone. Oshun bursts into tears. She tries to kill herself by cutting her own throat with the razor she secretly carries with her, but is prevented from doing so by Yojirô. Her mother knows her daughter's true heart for the first time. She apologizes to Denbê for forgetting justice and humanity because of her blind love for Oshun. In tears she allows them to marry and asks them to live as long as possible. Yojirô also agrees with Ogin and suggests that they flee from there, hand in hand. Being struck with emotion, Denbê and Oshun make up their minds to run away. Wishing the young couple good luck on their departure, Yojirô shows an auspicious dance performed by his two monkeys, which are compared to the young couple who are going to their honeymoon and death. 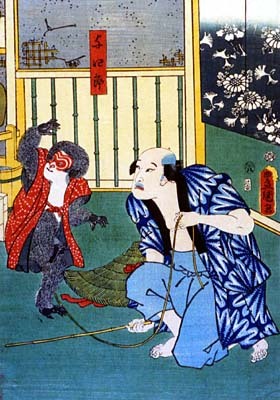 The Meiji star Onoe Kikugorô V had the idea once to use a real monkey on stage when he played the role of Yojirô. The highlight of the performance was something not expected by the actor: the monkey peeing on the stage ... to the audience's delight.